Can blue-eyed parents produce brown-eyed children? Melanin pigments produce the colour of the eyes. 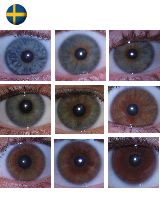 This article describes how melanin is formed in melanosome particles in the melanocytes and the genetics behind eye colour. Students will learn about the eye - how it is built and how genetics control eye colour.